毕业后荒废了很多时间. 最近收拾心情, 想找几个存储的开源项目学习下. 先看了fatcache的代码, 它是twitter开源的缓存服务, 可以认为是SSD版的memcache(索引还是在内存). 本文简单分析下, 做个备忘. fatcache使用generic queue维护资源使用情况, generic queue的实现在fc_queue.c. 和常见思路一致：fatcache在启动时, 预先分配一大块内存, 划分为多个元素, 并将多个元素组织成一个队列, 作为空闲队列. 需分配元素时, 将元素从空闲队列中弹出压入已使用队列. 当归还元素时, 将元素从已使用队列弹出压入到空闲队列. magic是魔数, 做校验用. sid表示该slab的id, cid表示该slab的级别. unused作为padding未使用. data便是item数组. 同一个slab在不同的周期可以属于不同slabclass(由cid确定). 其中,sid为slab的id, cid表示slab属于哪个级别. nalloc表示该slab当前已使用的item数, nfree表示该slab当前仍剩余的空闲item数. mem表示slab在内存中还是在磁盘上. 25 uint8_t md; /* sha1 message digest */ //作为key. 需要说明的是uint8_t md字段, 它表示key的摘要. 因为在fatchache中, key最长可以为256, 明显太大了, 所以fatcache认定md标志一个key, 多个不同的key如果md相同, fatcache将认为这些key相同. fatcache根据参数选项得知总共有多少slab级别(uint8_t nctable), 在内存中创建slabclass数组(struct slabclass *ctable), 依次初始化. 然后在内存中创建slabinfo数组(struct slabinfo *stable), 个数(uint32_t nstable)为配置的内存slab数(uint32_t nmslab)和磁盘slab数(uint32_t ndslab)之和. 然后将slabinfo数组逐一初始化, 前nmslab个元素slabinfo.mem为1, 表示slab在内存. 后ndslab个元素slabinfo.mem为0, 表示slab在磁盘. 然后fatcache创建一大块内存, 大小为nmslab * settings.slab_size (记住每个slab大小相同), 再将内存分割为多个slab并逐一入内存slab空闲队列(struct slabhinfo free_msinfoq). 同理, fatcache将磁盘分割为多个slab并逐一入磁盘slab空闲队列(struct slabhinfo free_dsinfoq). 3. 如果2.1或2.2都未成功分配, 则调用slab_drain()函数, 它将删除磁盘上最老的slab(通过slab_evict()), 然后调用_slab_drain()函数, 找到full_msinfoq中最老的一个slabinfo对应的内存mslab, 然后从free_dsinfoq中找到一个的磁盘dslab, 将mslab数据写入dslab, 交换两个slab对应的slabinfo的标志和所管理的数据的起始地址(即slabinfo.addr和slabinfo.mem). 然后尾递归调用slab_get_item()跳回1重新干活. 既然使用了generic queue, 淘汰策略必须是FIFO, 这是很容易实现的: slab如果有更新, 插入到queue尾部. 如果需淘汰, 从queue头部开始. 对于写操作：上面的流程保证了slab_get_item()返回的item必定在内存中, 所以上层可以直接将数据写入item尾部(item.end). 如果某个slab已写满, 且没有其他的空闲slab, 则上面的操作3所调用的_slab_drain()函数, 将内存slab和磁盘slab做数据交换时, 可以成片将数据写入磁盘. 可以理解为将随机写缓存在slab中转为顺序写. 对于删除操作：SSD在hash表的层面删掉索引. 数据不做修改, 等待自然淘汰. 这种机制保证了如果数据在SSD上, 可以不发生随机写. 代码虽然很短, 还是能学到一点知识, 尤其是随机写转为顺序写的思路. 最牛逼的是对删除请求, 只删索引不改数据的机制真是简单高效. 1. 关于删除操作: 上文没有介绍清楚, 这里详细解释下, 从item结构可以看出它没有next指针, 也就是说, 对某个slab而言, 可以认为它只提供append item操作, 新分配的item都压在slab数据尾部. 当需要删除某个key时, fatcache只在在hash表上删除对应的itemx(前文介绍过, itemx只是item的摘要, md唯一标识key), 也就是说不管item在内存slab还是在磁盘slab, 都不会发生删除item的操作. item的真正删除是以slab为单位, 从内存淘汰到磁盘后才发生的. 作为一个缓存服务, 这没有任何问题. 2. 如何将fatcache改造为永久存储服务: fatcache代码模块化不错, 改造起来应该没什么大问题, 比较不好处理的是第1点提到的未真正删除item而带来的存储空间出现空洞的问题. 这也许可以分两方面解决: 一是对item在内存的情况, 可以用对应slab上的最后一个item覆盖待删除item的空间(对同一slab, item大小是相同的), 这种方式可以保证slab作为数组类的操作, 不会出现空洞, 仍然不需要使用额外的next指针来维护链表; 二是对item在磁盘的情况, 可以通过某种机制在特定时刻触发磁盘slab的回收, 回收时可以针对该磁盘slab上的所有item, 一一查找hash表, 如果找不到itemx或者itemx指向存储空间不同(说明item已被删除, 或者删除后插入了key相同的数据), 跳过该item, 否则, 将item从fatcache中删除后重新插入. 最后将磁盘slab标记为free即可. 其中, Padding的作用是字节对其. 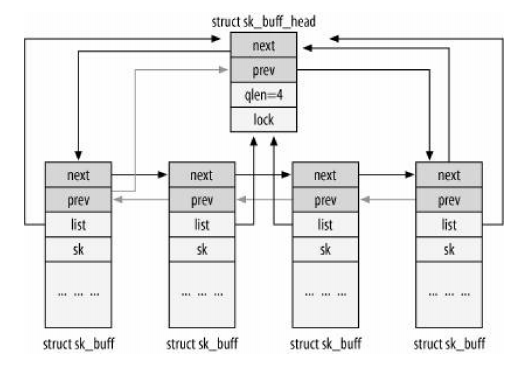 skb_shared_info这里不做介绍,详细信息参考<Understand Linux Network Kernel>. 如上图所示,中断处理程序将调用netif_rx()(net/dev/core.c). netif_rx()将接收到的数据压入被中断CPU的backlog队列,然后调度一个软中断(softirq, 一种内核行为,见 http://tldp.org/HOWTO/KernelAnalysis-HOWTO-5.html 和 http://www.netfilter.org/unreliable-guides/kernel-hacking/lk-hacking-guide.html 译注: 这里实际是指”下半段”,与硬中断的”上半段”呼应,见<Linux内核设计与实现> Update[2011-09-06] 译注错误: 软中断是bottom half的扩展,两者不应混为一谈. 操作系统之所以独立分开一个top half的概念,主要是因为中断是在CPU关中断(CLI)的情况下运行的,为了不丢失新到的中断信号,操作系统将中断服务程序一分为二,前者(top half)对其执行时间要求比较严格,一般立刻响应中断请求,为保证原子操作,它在关中断情况下执行,后者(bottom half)对时间要求没那么严格,通常在开中断下执行.但是,bottom half有一个致命的缺点,它只能在一个CPU上运行,也就是严格的串行,为了更充分的利用SMP,Linux2.4内核扩展了bottom half,成果便是所谓的”软中断(softirq)”机制,软中断最大的优点在于它可以在多CPU上运行,它在设计与实现中自始自终都贯彻了一个思想: “谁触发,谁执行(Who marks, Who runs),即触发软中断的那个CPU负责执行它所触发的软中断,而且每个 CPU 都由它自己的软中断触发与控制机制. ), 由 软中断来负责packet的进一步处理(比如说: TCP/IP 协议的处理). backlog队列的 长度为300个packet大小(/proc/sys/net/core/netdev_max_backlog). 当backlog队列为满时,它转入throttle状态,在此状态等待数据清空,然后重新回到正常状态,正常状态下,backlog允许packet的入队操作. (netif_rx(), net/dev/core.c). 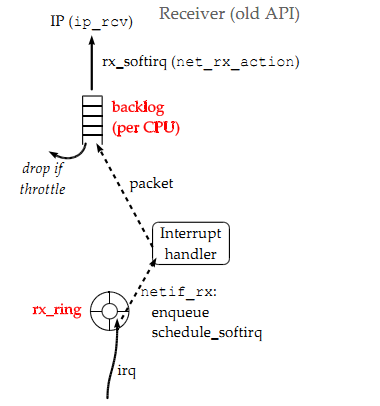 当backlog队列处于throttle状态时, netif_rx()将丢弃新来的packet. 我们可以通过/proc/net/softnet_stats来查看backlog队列的统计信息: 每一行对应一颗CPU,前两列分别是packet量和丢包量,第三列表示backlog队列有多少次进入了throttle状态. 如上图所示,内核采用的是NAPI新机制(见http://en.wikipedia.org/wiki/NAPI): 中断处理程序调用netif_rx_schedule()(include/linux/netdevice.h).该函数执行入队的对象不是packet,而是packet的一个引用(reference). 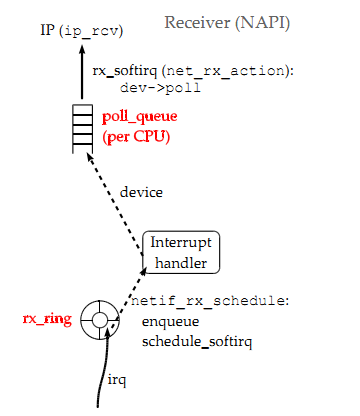 (softnet_data>poll_list; include/linux/netdevice.h). 与旧内核机制相同的是,中断处理程序同样会调度一个软中断.为了向后兼容, 在NAPI机制中, backlog被当作像网卡一样可以处理所有到达packet的虚拟设备.内核开发者重写了netif_rx(),该函数将packet压入backlog之后,又将backlog压入CPU的poll_list链表. CPU轮训其poll_list链表中的设备(注: NAPI中backlog为虚拟设备, process_backlog: net/core/dev.c),从设备的rx_ring环形队列中获得全部packet.CPU的轮询是通过 netif_receive_skb()(net/core/dev.c)调用ip_rcv()来完成的. 下图描述了packet在IP层的流转路径. 当一个packet到达主机后,如前文所述种种流程,net_rx_action()将它转给ip_rcv()处理. 在经过first netfilter hook后, ip_rcv_finish()验证该packet的目的地是否就是本机.如果是的话, ip_rcv_finish()将该packet传给ip_local_delivery(), 然后由ip_local_delivery()转发给合适的传输层(transport layer)处理函数(tcp, udp, etc). 如果路由表(它是一种hash表)中存在packet的路由信息的话,该packet的行经路径通过ip_route_input()查找,否则,通过ip_route_input_slow(). 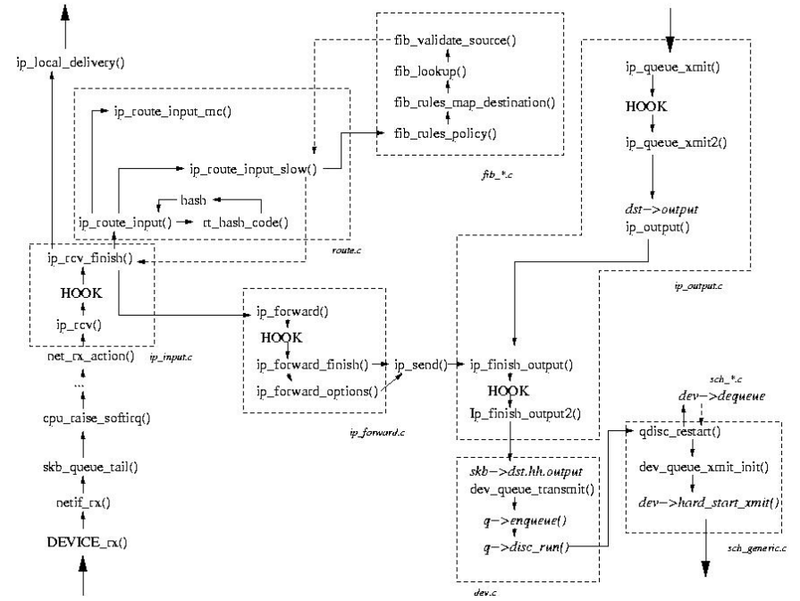 ip_route_input_slow()调用fib(Forward informationbase, 路由表)族函数,这些函数定义在fib*.c文件中. FIB结构体非常复杂. 在计算出packet的路由信息之后,内核往IP pcaket插入新的目的地址,并将其所属设备信息插入对应的sk_buff结构. 然后,packet被转发(forwarding)函数(ip_forward() 和 ip_forward_finish()). 一个packet也可以从上层发往ip层(通过 TCP or UDP 传输). 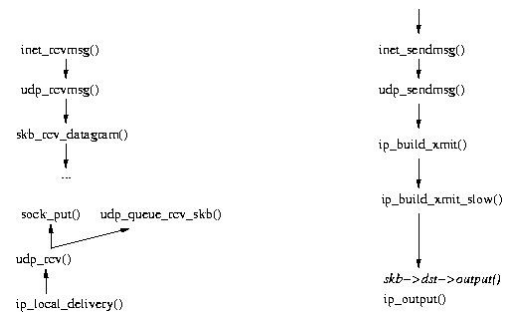 处理该packet的第一个函数ip_queue_xmit(),它通过ip_output()将packet发往output part. output part对packet做了最后的修改. 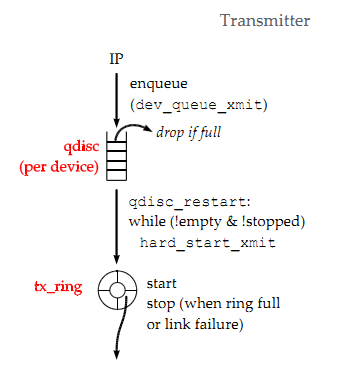 dev_queue_transmit()将packet压入输出队列(output queue),然后通过q->disc_run()来调用网络调度机制(network scheduler mechanism).该指针指向不同的函数,这取决于内核采用的调度器(默认为FIFO类型,可以通过tc工具进行设置). TCP input在TCP实现中占了很大一部分.它处理TCP packet的接收,因为TCP实体(TCP entity, 也就是TCP协议栈)可以同时处于接收和发送两种状态,所以这两类代码混杂在了一起. tcp_paws_discard()负责PAWS(Protection Against Wrapped Sequence Numbers). 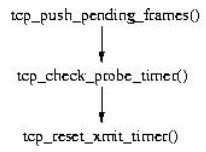 STEP 1 – 检查packet序列号(sequence). 如果序列号不再接收端口中,接收模块(receiver)将 通过tcp_send_dupack()发回一个DUPACK.tcp_send_dupack()通过tcp_dsack_set()设置一个SACK,然后调用tcp_send_ack()进行发送. Finally, 通过tcp_ack_snd_check()检查是否有ACK要发回.ACK的发回有两种情况: 通过tcp_send_ack()直接发回; 或者通过tcp_send_delayed_ack()延时发回(译注: 这是TCP的延时确认(Delayed ACK)机制,目的为减少分组,可通过/proc/sys/net/ipv4/tcp_delack_min设置),被延时的ACK存储在tcp->ack.pending. 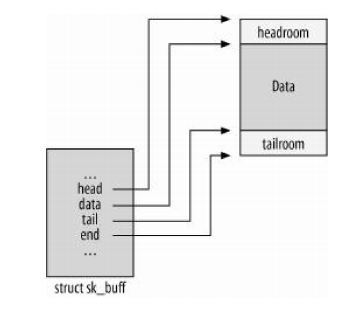 tcp_data_queue()负责处理packet数据.如果packet顺序到达(所有之前的packet已到达),它将把数据拷贝到tp->ucopy.iov (skb_copy_datagram_iovec(skb, 0, tp->ucopy.iov, chunk)). packet的到达引起各种反应,这由tcp_event_data_recv()处理. 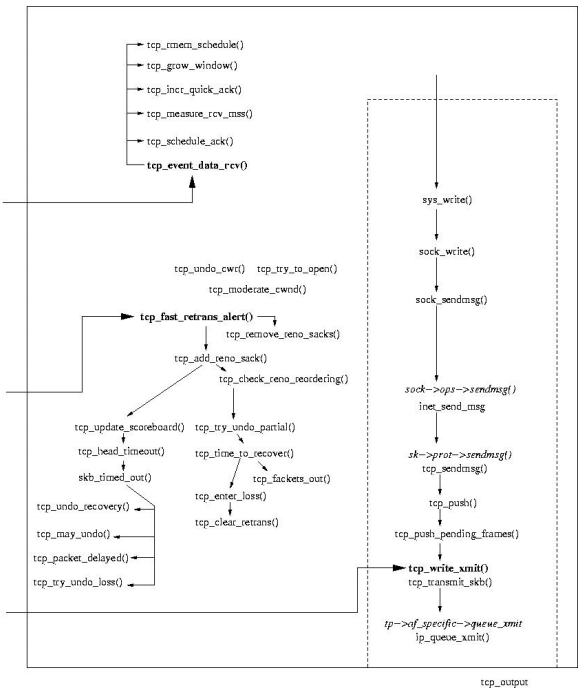 它首先通过tcp_schedule_ack()调度一个ACK的发回,然后通过tcp_measure_rcv_mss()估算MSS(Maximum Segment Size).在特定的情况下(如: 慢启动), tcp_event_data_recv()选择调用tcp_incr_quickack(),以立刻返回ACK(即不使用延时确认机制).最后, tcp_event_data_recv()通过tcp_grow_window()增大通告窗口(advertised window, 译注: 其实也就是receive window,即接收窗口,更多参数设定见 http://140.116.72.80/~smallko/ns2/TCPparameter.htm). 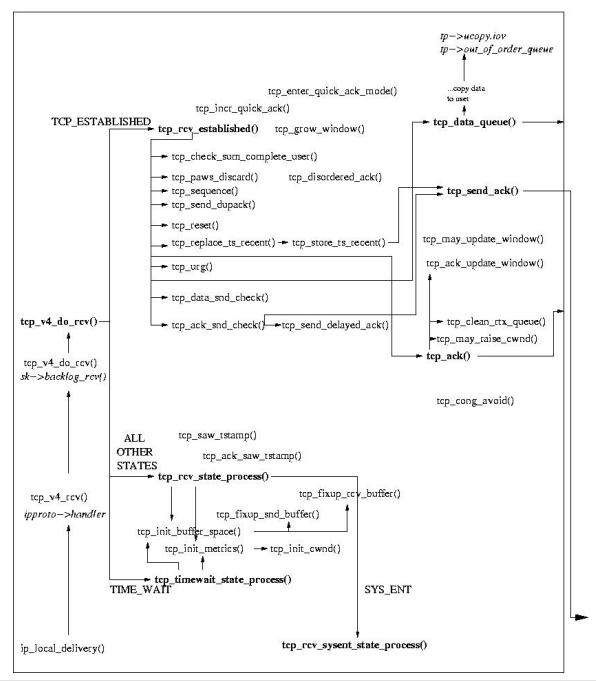 这些状态保存于tp->ca_state,对应值分别是TCP_CA_Open, TCP_CA_Disorder, TCP_CA_Cwr, TCP_CA_Recover 和 TCP_CA_Loss. 定时器的超时事件会产生一个软中断,软中断通过timer_bh()调用run_timer_list(). run_timer_list()将调用timer->function函数指针指向的tcp_wite_timer(). tcp_wite_timer()进而调用tcp_retransmit_timer(),最终, tcp_wite_timer()调用tcp_enter_loss(). tcp_enter_loss()将拥塞控制状态设为CA_Loss,然后由fastretransmit_alert()重传packet. ECN(Explicit Congestion Notification,即显式拥塞通知)代码比较简单, 几乎所有的代码都在/include/net目录下的tcp_ecn.h文件中. tcp_ack()调用TCP_ECN_rcv_ecn_echo()来处理ECN packet. 当packet通过ip_local_delivery()从IP层到达时,它被传给udp_rcv()(该函数角色类似于TCP的tcp_v4_rcv()). udp_rcv()调用sock_put()将packet压入socket queue.packet的传递就到此结束了.内核然后调用inet_recvmsg()(通过recvmsg()系统调用), inet_recvmsg()调用udp_recvmsg(), 而udp_recvmsg()进一步调用skb_rcv_datagram(). 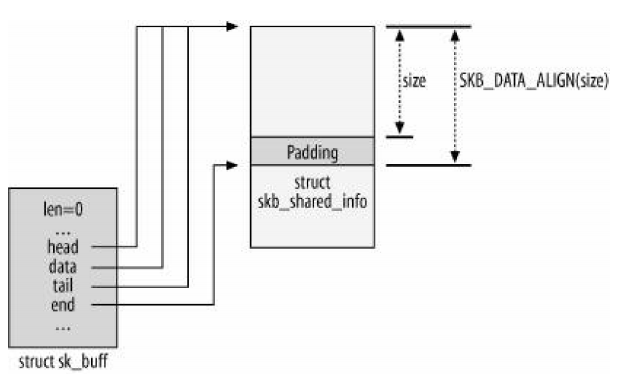 skb_rcv_datagram()函数从队列中获得packet,然后据此packet填充用户态将读取的结构体. 当一个packet从用户态到达时(译注: 也就是说要发送出去),处理就更加简单了. inet_sendmsg()调用udp_sendmsg(), udp_sendmsg()通过从sk结构体获取的信息(这些信息在socket被创建和被绑定(bind调用)时被设置于sk中)填充UDP数据报(UDP datagram). IP packet创建完成以后, packet被传给ip_output(),正如4 – Network Layer 介绍的一样, ip_output()将packet发往更低层.